Every year there is a presidential biography whose publication is such a significant event that I almost feel compelled to take a vacation day in honor of its release. About three years ago I read a half-dozen biographies of Ulysses Grant in an attempt to uncover the very best. My favorite at that time (and by a fairly wide margin) was Jean Edward Smith’s “Grant” which I enjoyed immensely and still heartily recommend. Since then, Ronald White, Charles Calhoun and now Ron Chernow have published their own biographies of the 18th president…so I definitely have some catching up to do! * It is worth noting that also being released today is “Hoover: An Extraordinary Life in Extraordinary Times” by Kenneth Whyte. Despite Herbert Hoover’s presidential defects, his pre-presidency is absurdly fascinating and I have high hopes for this biography. 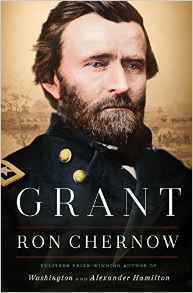 “Pulitzer Prize winner Ron Chernow returns with a sweeping and dramatic portrait of one of our most compelling generals and presidents, Ulysses S. Grant. Ulysses S. Grant’s life has typically been misunderstood. All too often he is caricatured as a chronic loser and an inept businessman, or as the triumphant but brutal Union general of the Civil War. But these stereotypes don’t come close to capturing him, as Chernow shows in his masterful biography, the first to provide a complete understanding of the general and president whose fortunes rose and fell with dizzying speed and frequency. Managed to find a pre-copy and have about 100 pages left of it. So far it has lived up to expectations.. I missed a pre-copy at a used bookstore in NYC a couple weeks ago by less than 12 hours. Not that I’d have time to squeeze it into my schedule at the moment, but still… 🙂 I’m glad to hear it’s as good as you expected; my bar for Chernow is quite high so my fingers are crossed I won’t be disappointed! Thanks for the information, Steve. I hope Ron Chernow will be a guest on Charlie Rose in the next few weeks to talk about this book. But I will be most interested in your review (it may appear after you finish your first round of biographies), especially in comparison with your assessment of Jean Edward Smith’s “Grant,” which you rated very highly. Your words of praise for Smith’s preface in the Grant book made me re-evaluate my comment to you a few weeks ago about the lack of an overall evaluation of FDR in Smith’s biography of him. I later re-read Smith’s preface/introduction in that biography and he does provide an excellent appraisal of FDR’s personal and political life. Mr. Chernow was interviewed recently by Charlie, and co-hosts, on CBS This Morning. A very short segment. I too hope he gets a full hour at the table very soon. Based on his website he will be back in NY late this week. I hope Brian Lamb has some time booked for him as well. Grant, the musical could be coming! Now THAT would be most welcome! Absolutely wonderful. I wonder if “Grant” might make a better historic epic, however. Either way, I will take any artistic production that brings to life Ulysses S. Grant and his amazing life and times. Grant would make a pretty interesting dramatic character! Here it is, Ron Chernow himself saying he would like this book to inspire a feature film. This was on CBS This Morning earlier this week. Here’s hoping! This clip is about 6 minutes and highly worth your time to watch. Thanks for this post, Steve! I’ve been looking for reviews of this every day, so have already read all those on the days they were released. My copy arrives today and even though I’m currently in the middle of 4 other books, I may put them on hold and dive into this and try to finish it within the next week. Well, I have AD/HD, and I’ve found that when I read multiple books, it actually helps hone my focus. I can’t focus as good, however, if they’re too similar. So I am usually reading one biography, one general history book about an era or event, a religious history book, and then some fiction from the 100 Greatest Books Ever Written. First impressions–it’s everything I hoped it would be thus far. It looks like the bulk is dedicated to the war years, with the last third being presidency and final years (I’ve only read through his years of failure after leaving the army). So far the writing is just what I expected, and the research is illuminating me to things I didn’t know before. There are some aspects of Grant I’ve researched extensively, but am still learning new things. Chernow uses primary source quotes so effectively to describe Grant’s character and actions. He weaves them seamlessly throughout his narrative very frequently and effectively. Oh boy, this is a fun read. I can’t wait to get back to it tonight. Although it is not presidential, you are four books away from deciding if The Power Broker would be worthy of inclusion on your post-journey books. It is truly a masterpiece. Thank you for noting Ken Whyte’s new Hoover bio. After a long quiet period, there have been three major studies recently (i.e, Rappleye, Jeansonne, and Whyte). Whyte’s bio on Hoover arrived in the same package as my copy of ‘Grant’, as they were released the same day. While my excitement was greater for ‘Grant,’ I have nonetheless been excited for Whyte’s as well. I have already read Rappleye and Jeansonne’s works, and both were excellent. Of course, neither was as exhaustive as Whyte’s appears to be. I’ve read the 6 volume Hoover bio, but am hoping Whyte’s becomes the definitive single volume, cradle to grave biography on Hoover. I have already read the intro and conclusion (the first thing I do with every new book), and so far it has great promise. I enjoyed those chapters immensely. This is such a wonderful website! I’m hoping to set out on a grand quest to read a biography for each president. This place is a great guide for that so thank you!! I just ordered Grant as well as the Hoover biography. So far I own biographies for the first 5 (including Chernow’s “Washington”). I’ve read Berg’s “Wilson” but I’ll probably seek out a different one when I get back to #28 (although I loved Berg’s writing style and have been meaning to get to his “Lindbergh”). I’m going to go in order, one book for president. I’m trying for cradle-to-grave biographies that focus a lot on all aspects of their life. For Grover Cleveland, I’m going to read Volume 1 of Nevins’ bio after Arthur, then Volume 2 after B. Harrison. When I get to more recent presidents, I’ll have to try hard to find nonpartisan books! For someone just starting out on this, are there any recommendations or warnings you have? Congrats on your journey – you are setting out to tackle what I was hoping to accomplish when I realized the difficulty of finding that one “perfect” biography for each president! Recommendations include (i) when relying on reviews, ignore the ratings and focus on what the review actually says; if you are reading a thorough review you’ll recognize whether the author’s style will appeal to you or not, (ii) don’t be surprised to find really good bios of some of the lesser-known presidents – savor these moments! (iii) don’t be surprised when you can’t narrow the list for certain presidents (I don’t know HOW you’re going to choose just one book on Lincoln or FDR), (iv) have fun, and (v) let me know what you think about books as you work your way through! For those who have read (or started to read) this – how does it compare to Ronald White’s Grant biography from earlier this year? I thoroughly enjoyed that one. When I saw this in the bookstore, I “helped” my parents out and got it for them to give to me for Christmas, so I have a bit of time before I start (which is okay, I’m reading several other books at the moment!). Read Chernow’s book this week. I was skeptical that we needed a new Grant biography since so many have come out over the past few years (heck, Ronald C. White just gave us an excellent one last year), and admittedly I’m not sure I learned much that was truly new from Chernow’s book. That said, a well-written, engaging and reasonably balanced biography by a great historian is always worth checking out (he handled touchy issues like Grant’s troubled presidency and alcoholism with commendable even-handedness). Look forward to reading your thoughts if/when you get around to it. Thanks, I’ll definitely be reading this – it’s high on my “follow-up” list. I only wish this book, White’s and Calhoun’s had already been published when I was tackling Grant 3 years ago. Still, it will all make for great follow-up reading and your comments on Chernow’s book are in nearly total agreement with what I’ve heard so far. We didn’t have to wait long for this exciting news. Still no full-length interview with Charlie Rose. I’m quite curious: now that Chernow has revealed his Grant biography to the world, how would it compare to Edward Smith’s 2002 Grant for you? I’m excited to hear your thoughts since I’m still on the fence regarding which one of them to purchase. I haven’t read Chernow’s Grant biography yet – it came out after I had already gotten through the Grant portion of my journey…but this biography is near the very top of my “follow-up” list so I’ll be reading it in early 2019!